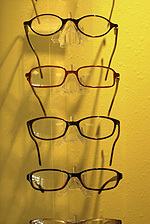 We offer a wide variety of both frames and lenses. Our opticians will assist you in the selection of your frames to fit your face and your style as well as your prescription. Our opticians are skilled in assessing your specific vision needs and matching your needs to the great variety of lens and frame options available today. Our full service in-office laboratory can fabricate most prescriptions in a very short period of time without sacrificing quality. We realize that the most precise ophthalmic prescription written by our doctors is only as good as the glasses that are made from that prescription. We provide access to the most current lens designs available today which improve both cosmetic appearance and visual function. Designs such as super thin high index lens materials, progressive addition or "no-line" multifocal lenses, photochromatic "transitions" lenses, and a great selection of over 1,000 contemporary and designer frames allows our patients to both see great and look great with their glasses from Broward Eye Care. We offer many styles, shapes and materials to satisfy the fashion taste and vision requirements of every patient. A large selection of brand-name contact lenses is also available.